CES is the mecca of cool new dreams and ideas, but some companies go a bit further than the hypothetical and actually show off some products. 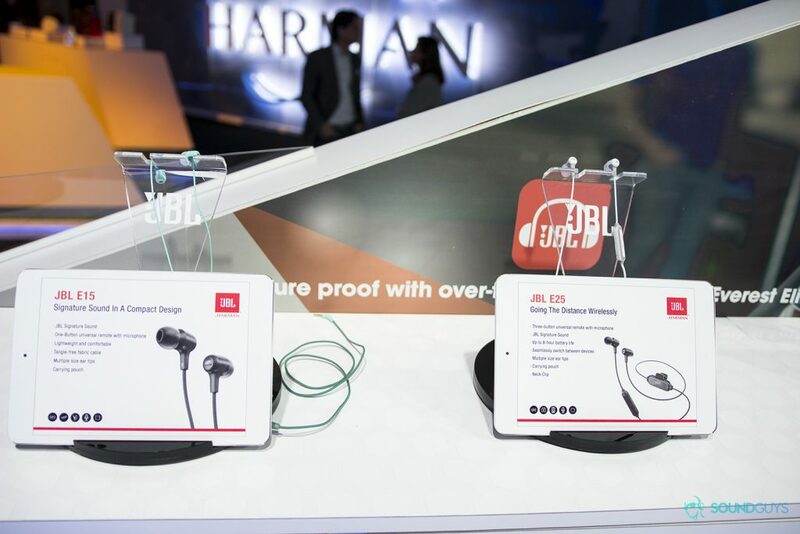 One company in particular that showed off a ton a new stuff was Harman, with a bunch of new JBL and AKG products. We got a chance to check them out. One interesting product JBL was showing off was their new Soundgear. It’s basically a speaker you wear around your neck and though I was a little thrown off by it at first, some of it’s applications make a lot of sense. For instance: VR. You might not be able to completely leave reality everytime you play a game, so if you want to enter VR but still want to be aware of your surroundings this is a good way to do it. You’ll get 6 hours of constant playback time, dual noise cancelling microphones for phone calls, and a Bluetooth speaker you can wear for $199. There was a lot going on with E-Series this year, so let’s go through them all. First were the E15 in-ears. These are a wired pair of ‘buds that have a tangle free cable and 8.6mm drivers. At $39, they’re the least expensive pair of headphones to be announced. If you want to go wireless you can step it up with the E25BT in-ears, which share the same 8.6mm drivers but add Bluetooth to the mix. You’ll get a solid 8 hour battery life out of these and they’ll run you about $59. Next up are the on-ear Bluetooth headphones dubbed the E45BT headphones. These have a fabric headband for comfort, 40mm drivers, playback controls built into the bottom of the earcup, a microphone for phone calls, and a 16 hour battery life. They also fold for easy portability and, if you can’t tell the trend yet, will cost a little more than the in-ears at $99. After that are the E55BT headphones which are the largest headphones in the line-up. These are over-ears packing 55mm drivers in each ear cup along with the same playback controls and microphone, but JBL claims that these will get you around 20 hours of constant playback. There is one more pair that was announced though, and that’s the E55 Q-edition. You might remember the Quincy Jones AKG N60Q headphones we reviewed a while back, and that branding has finally trickled down to something a little more affordable, with a few extra tricks. That said, these are still E55 headphones, meaning that they’re still Bluetooth, still has playback controls and a mic on the bottom of the ear cup, and are still over-ears. But they come in two new colors, black and gold and also this sand pink color. 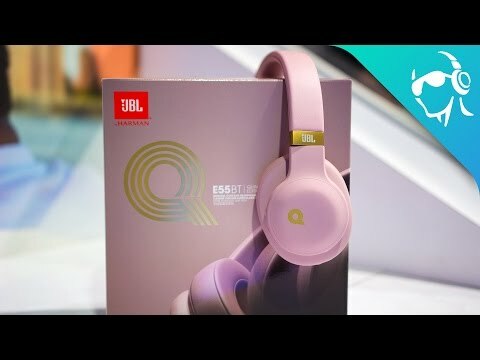 They were EQ’d by Quincy Jones himself and for the cherry on top, the voice prompts you get when you turn on the headphones or pair them to a new device is Quincy’s voice. It’s awesome, but will cost you $50 more than the regular E55s at $199. Then there were the new speakers. One of them being the JBL Playlist with built in Google Cast so you can easily play music over your Wi-Fi from your phone or tablet. It also has Spotify connect which makes it easier to choose the speaker from inside the Spotify app itself, all for $149. Then there’s the JBL Pulse 3 which if you were keeping up with our daily CES videos, turned out to be my favorite speaker JBL debuted. It’s been completely redesigned so that it now looks more like a lava lamp than ever before, and the colors pulse with the music you listen to. You can also connect up to 100 compatible JBL speakers together using the JBL Connect+ app. If you decide to get a few Pulse 3’s, picking up and shaking the master speaker will change all of the others to match the same exact color pattern. It now has a 12 hour battery life, full 360-degrees of sound, an IPX7 certification, and a $199 price tag. After that was the new JBL Flip 4. This speaker has been upgraded with a new material that makes it “adventure-proof”, which basically means it also has an IPX7 certification and can be completely submerged in water. It too has a 12 hour battery life and is compatible with the JBL Connect+ app so you can connect it to a bunch of other JBL speakers. It also has Voice Assistant integration so you can access Siri or Google Now with the press of a button. Luckily, all these new features haven’t changed the price of the Flip and it’ll still cost only $99. AKG also had a few new products to show off, starting with the N60 NC wireless. We loved the N60 NC headphones when we reviewed them, and now they’re wireless. That does make the earcups a little bit larger but not by as much as you might think. These still have active noise cancelling so you can get a few different battery life expectancies depending on what you do, ranging from 30 hours while connected via Bluetooth with no ANC, to about 15 hours with Bluetooth and ANC turned on. These will cost $299 when they become available this Spring. AKG is well aware that some people no longer have easy access to a 3.5mm input, so the new N20LT in-ears end in a Lightning connector instead. You can plug these right into your iOS device and Harman says that this will secure a lossless digital connection so you can enjoy higher quality sound. If you’re like me and still have a bunch of 3.5mm devices, there’s also the new AKG N30 in-ears which have hybrid drivers (one dynamic and one balanced armature). These are High-Res certified but you also get two extra filters in the box to further tune the sound to your preferences.